Gabriel Ferrand (1864-1935) travelled widely as a French diplomat and pursued scholarly passions as a polyglot orientalist. He served as consul to Madagascar and published several works about the island, noting the Arab influence that preceded the arrival of Europeans. 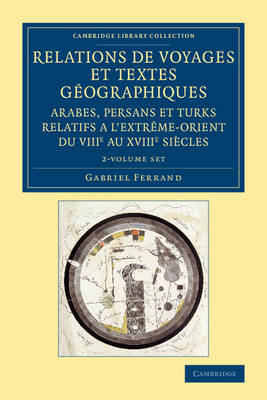 A member of the Société Asiatique, and editor of its journal from 1920 until his death, Ferrand sought in particular to make Arabic geographical and nautical writings more accessible to fellow scholars and students. Forming part of that project, this work appeared in two volumes in 1913-14. It presents annotated French translations of mainly Arabic texts relating to the Far East. Brief biographical notes on the authors are given for the benefit of non-specialists. Volume 1 contains the preliminary matter regarding transcription and translation, followed by texts up to the thirteenth century. Volume 2 includes a section of translated extracts from Chinese, Japanese, Tamil, Kawi and Malay texts.